Our organization is composed of hunters willing to pay with most travailing to hunt. Those who do so looking for quality deer management. Looking over our pictures show most are seasoned hunters beyond development stage. While we do not promote ourselves as a trophy exclusive organization most bucks harvested are trophies. We do not have any quality standards above state regulations. There are youth and spouses with their definition of a trophy below that of P&Y, B&C. There are mature successful trophy hunters with doe pictures. We promote a quality deer hunt alone. 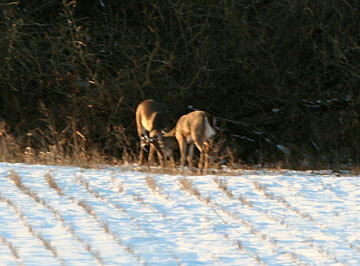 All are welcome to harvest as many doe as they want. Quality Deer Management on non-contiguous lease land is a futile effort. Any attempt on our part for quality deer management would simply be useless effort. Our approach is by its very nature of our self guided hunter largely a trophy deer hunter organization. The self guided hunter is above a public lands hunter mentality of having to get a buck before anyone else. That combined with we exist within a well know trophy whitetail region of Iowa, Kansas and Missouri deer hunters come with a trophy mind set. Most are not willing to suffer the wrath of ridicule for shooting a small buck. First, on trophy deer, while we do not have rack size prohibitions, we do encourage that all deer hunters harvest only racks that are larger than what they previously have harvested. Once a hunter reaches the 140 class deer then successive trophies of this magnitude are acceptable. This policy allows deer hunter an ability to start his children hunting with success on easier to obtain smaller racks and build up. Non-residents who come from areas were lower scoring racks are truly trophy deer is free to start his central mid-west hunting career at his own selected entry point and move on up from there as well. Doe harvest is of special concern to us. It is highly encouraged. We do have landowners who request additional deer hunters to help thin their local doe population. 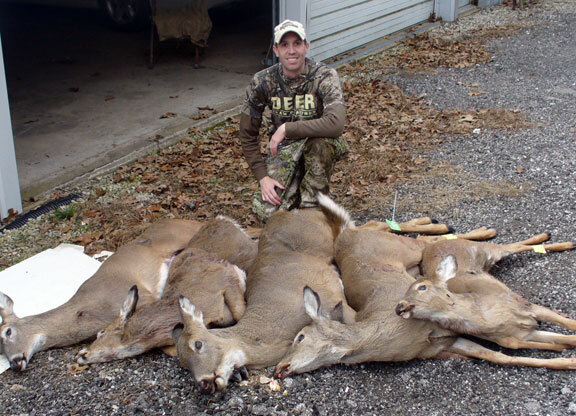 For any hunter wanting to fill a freezer with venison he is encouraged to hunt any of the several doe only seasons as much as he can. We also list every meat processing plant we are aware of. Including those which support meat donation programs. Meat lockers are listed along side lodging listing for every county we have land. 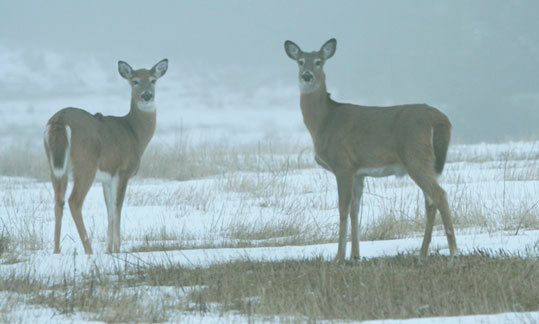 Deer hunters are encouraged to harvest doe and employ these programs. 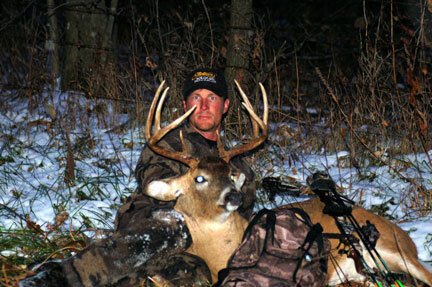 In spite of our deer hunting approach being for enjoyment of a hunt the reality is most self guided deer hunters and especially those who travel to deer hunt are after trophies. In any case of any of our hunters be they primarily deer hunters or not we encourage all who want to feed themselves or their dogs throughout the year to do so with doe meat. Below are some statistics on central mid-west Whitetail Deer taken as a snap shot of six years worth of data. As in all statistics, the numbers by themselves have little meaning without the conditions they were collected also ascribed to the data. 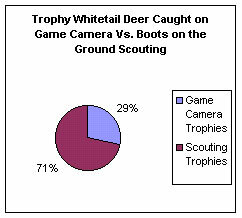 All we are attempting to do with these deer camera statistics is provide yet one more snapshot into various aspects of whitetail behavior. And of course, our typical declaimer is this data should not be accepted as statistical potential accuracy for any future self guided deer hunter experience. This data is based on deer scouting camera photographs over a variety of natural terrain. No food plot, feeder or chemical attractants were employed. 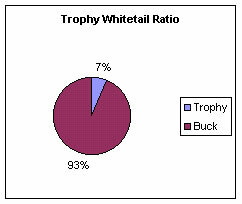 Some deer hunters have interpreted these statistic as demonstrating un-pressured nature of our whitetail deer. It is commonly accepted the more pressure deer receive the more nocturnal their activity. 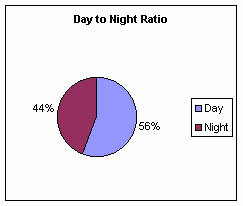 In this case we demonstrate an overall average of greater day to night deer activity. Or, the fact our locality has far fewer human to deer contacts as a matter of year round routine. With a lower local human population deer are likely to have more daytime activity not requiring the concealment of night to avoid humans who retire to their homes after dark. Our surveys have shown this deer behavior data point to be highly circumstantial. 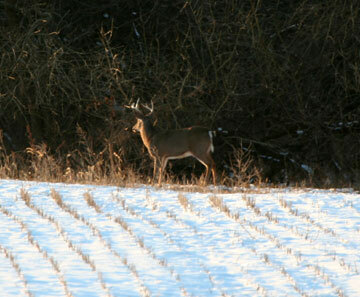 A dramatic distinction has surfaced between inactive and active farm daylight deer activity. 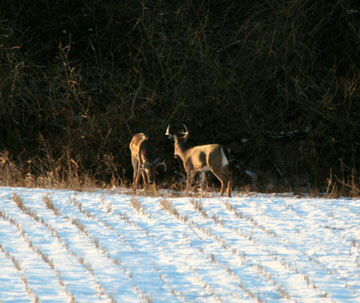 Inactive farms of 160 acres and larger have accounted for up to 92% daylight deer activity. An inactive farm is one that may be enrolled into CRP or one that only sees active farming during cropping periods and is otherwise unattended. Active farms have demonstrated a converse with as little as 13% daylight deer movement. 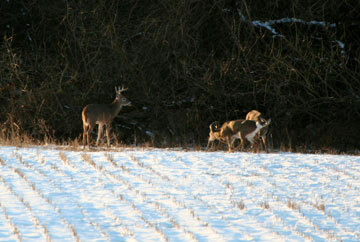 An active farm has a more frequent appearance of humans seemingly suppressing deer activity. It may be a simple as a farmyard on the property. Or, one that has more exposed acreage to roadways. 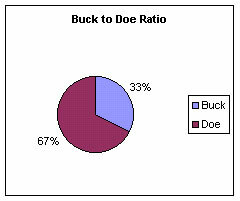 Nothing more than an indicator of the number of bucks compared to doe deer ratio. This count is of only comparing deer with visible antlers. Button bucks are subsumed in the doe count. This data was collected only as a means of being thorough. We do not imply any hunt quality enhancement with its numbers. Our least informative deer statistic. We have our cameras out starting in July running to February 1. A spring or later early summer rack is nothing to read as a trophy deer, or not. Our definition of a trophy was purely subjective by looking at pictured racks. If it was one we would draw on. And, of course, there is no implied guarantee this percentage of trophy whitetail deer will be what every deer hunter will find. This deer statistic is offered only as a simple attempt to provide a more detailed and obviously incomplete picture of the central mid-west whitetail deer. Our most useful deer scouting and hunting statistic is this one, below. It shows if you want to find trophy class whitetail deer you should put your boots on the ground and scout. Another view point comes from the traveling hunter who does not scout. Only comes out to hunt and tags a trophy. His experience is it is the skill of the hunter, not results from a camera, for where to put a stand. This statistic is all the more impressive when it is agreed to game cameras are out in the field 24/7 and our physical scouting covers far fewer hours. 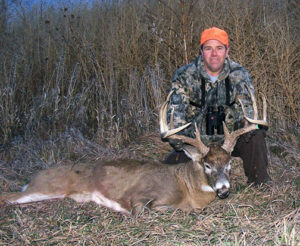 Finding a trophy class whitetail deer is not your challenge. Putting that deer in your truck is the issue. It appears that hunting time is the key. Not how many cameras are placed. All deer scouting data on these charts is cumulative. We have ranged between 1 and a maximum of 4 operational scouting cameras at any one time. As deer numbers continued to be additive the variance from year to year became less pronounced. Or, a more statistical sound baseline was developed. We ceased tracking camera statistics when deer observations variance flattened. That happened early in the six years of this survey. First, static numbers started showing in year 3. By year 5 there was less than 1% change in any of the numbers. Just wanted to send an update from my Midwest hunt. Yet again I must commend you and the MAHA Staff for doing such an exceptional job. I am so glad that I found this organization. I had more success this year on my [location deleted] bow hunt. I hunted in [location deleted] on a piece of property that is fantastic. It is up for sale, unfortunately, and that is bad news. Nonetheless, it was an awesome hunt. As usual the big ones would just not cooperate. I saw a monster 5 x 5 almost every day that I hunted. I just could not get into position for a shot. I saw a lot of big 4 x 4’s and almost got an awesome one on the first day of the hunt. On day six or seven, can’t remember, this 4 x 4 came into my shooting lane at 32 yards. It was 330 PM and it was snowing pretty hard. It made for a pretty cool hunt. Thanks, again for what you guys do. I truly get excited every year knowing that I have the ability to go out to the midwest and tackle those big deer. Enclosed are some pics of my [location deleted] bow kill. They are a little dark but they aren’t too bad.